…[KISS guitarist Tommy] Thayer’s path, of course, was not a straight shot from the bedroom to the KISS stage. He first rose to prominence as the guitarist in Eighties hard rock act Black ‘N Blue, who opened for KISS on tour and for whom Simmons produced a pair of albums. Post-Black ‘N Blue, Thayer also performed as Ace Frehley in a KISS tribute act, Cold Gin. 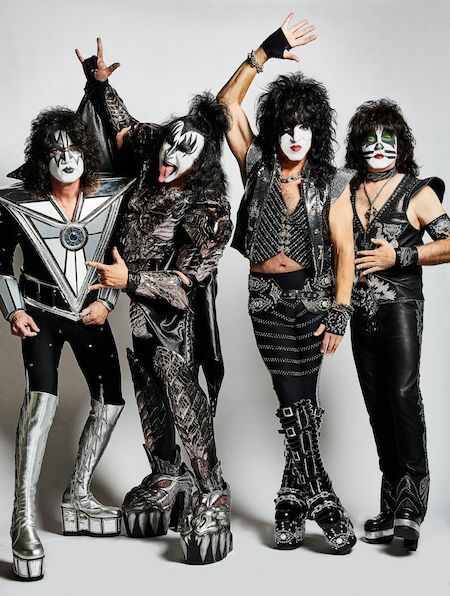 He was brought into the KISS organization in an administrative capacity in the mid-Nineties and assumed the role of the Spaceman in 2002 after Ace Frehley parted ways with the band following their reunion. …As for how he feels about possibly playing alongside Frehley or Eighties-era guitarist Bruce Kulick, were they to show up as surprise guests on this final run? “I think if it happens kind of organically, it would be great,” Thayer says. Read more at Guitar World. Peter Criss did not make Eric Singer. The guy had a legit track record with Lita Ford and BLACK SABBATH prior to joining KISS. The SABBATH album THE ETERNAL IDOL features amazing work by Eric Singer. Tommy Thayer is adequate but Eric Singer is a great drummer and if RUSH decides to keep going then they should consider Eric Singer. He certainly cannot sing anywhere near as well as Peter but the drumming is top notch. I’m definitely a fan of his. To be clear, he is not the Catman but what are you going to do? Michael, you are correct. Eric is not the Catman, that’s not his persona. It was, as still is IMO, Peter’s persona. Eric, along with Tommy, should have been able to have his own character/persona. I think both Eric and Tommy are better players of their instruments than Peter and Ace, but I don’t think it’s morally right seeing them impersonate the personas created by others. I know, not their fault as they’re just following the marching orders of Paul and Gene, but it still is sickening to me…. Thayer’s been impersonating Ace Frehley’s original Spaceman character since his Cold Gin days beginning in 1991, and he continues that impersonation to this day. Thayer’s been impersonating for so long that he’s brainwashed to believe he really IS the Spaceman. He’s a great guitar player, but couldn’t find success as his own musician with Black ‘N Blue. So he finds a gig impersonating a legend of a musician in Ace Frehley. I know if it wasn’t Thayer, it would be some other guy impersonating Ace. But it makes me so sick seeing someone else portraying the Spaceman character. The stage moves, the guitar rockets, the makeup, etc….it’s just disgusting seeing the impersonation of a legend. BRAINWASHED TO BELIEVE THAT HE REALLY IS THE SPACEMAN! Do you honestly believe that these guys are so sinister that they’re brainwashing people to think that they’re Spacemen or Cat people? My God, this Gene Simmons must be an actual demon. For God’s sake man, it’s 4 guys singing 40 year old songs for middle aged guys having a little fun. This is KISS derangement syndrome. GUYS! GUYS! GUYS! STOP! Please post another bunch of stories. Geoff Tate nonsense, TESLA, King Diamond, another awful Roth picture, the shirtless DEF LEPPARD Guy, Michael Bolton, anything? Oh no, I put a moratorium on that song. Michael, I was being sarcastic with my “brainwashed” comment. Oops! 😉 I was actually just pleading my case, sort of. Ugh, that song is terrible, too. Please make it stop. LOL!!! The chemistry in the original lineup is no fluke; you watch Ace and Gene sitting in someone’s living room flubbing though Cold Gin and that chemistry is just undeniable; it grabs me outta my seat…it still does…and that magic would’ve worked in the 90’s in the studio…they’d just retaken the heavyweight championship belt; just put those 4 in a room and hit record….I think Paul was on Peter’s case so much about his drumming that Pete was back there overthinking everything…Paul’s and Gene’s efforts on making it work with the reunion, notwithstanding the drama of Ace and Peter, were disingenuous. I don’t put as much emotion into the characters as I do with the players…in other words, what bugs me more is that these guys squandered their very rare chemistry as a band…so, seeing two guys masquerading as “Ace” and “Peter” …sure, they might as well wear UPS uniforms …to me, but they do their best….in other words, it’s not seeing her with someone else that hurts you…it’s the breakup itself.